Those two quotes from Deep Work by Cal Newport summarizes my feelings toward this excellent book. Newport introduces deep work as to counteract the distracted world we live with in the social media age. The importance of deep concentration can help employees of all types to achieve successful careers in a workplace where shallow thinking flourishes. 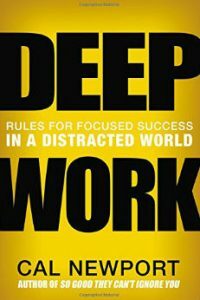 Deep Work looks at the effect of the connected age and proposes techniques and strategies for going deep in our work or profession. However, Newport does not come down with a sledgehammer against the social media age, but provides insights on how to navigate our way through its maze to achieve depth. Newport uses examples from his own life as an associate professor and as well as several others to reveal that deep work does belong in our culture. It can be used as an advantage for a meaningful career. The book is divided in two sections: the first section lays out the philosophy for deep work and the second section lays out the rules for going deep. Both sections of the book cohere to Newport’s argument for depth. I wrote in my last review, Essentalism, it was the important book I read in 2016. Well, I would like to add that Deep Work is the second most important book I’ve read this year. I highly recommend Deep Work and those aforementioned quotes brought home the importance of this philosophy.